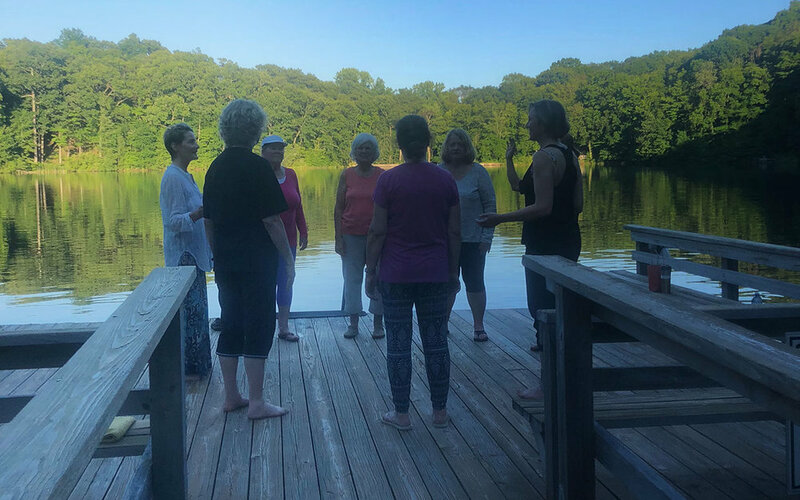 May 7, 2019 • 6:30–9:30 p.m.
By transforming old wounds to strengthen our female warrior selves, we become community healers. When unexplored, past events can leave a scar or an emotional hurt that you may have difficulty addressing. Through a meditation and a forgiveness ritual circle, we’ll take steps toward a new beginning, a fresh perspective on the woman within. Tuesday, April 2 • 6:30–8:30 p.m.
Join two of IYI’s senior teachers in a joyful, healing journey of sound healing with gongs, bowls, and your own voice through special Qigong chants from Nadiya’s master teacher’s lineage. As you lie down in savasana, you will be guided through healing visualizations accompanied by Laksmi’s renowned sound work to heal body and soul while calming the mind and revitalizing the body’s organ systems. Wednesday, December 12 • 6:30–8:00 p.m.
Qigong offers deep insights into the daily “medicine” of Nature and the universe. Nadiya has developed a special fusion of Yoga and Qigong to build the body with the extraordinary benefits of pranayama and meditation. Recent studies of Qigong and Tai Chi at both Harvard Medical School and Beijing University have shown the work to be powerful support for the body, balance, and mind. In this class you will receive a new understanding of building strength in standing poses, mudras for meditation insight and a boost to immunity.